・Prescribing the way without the use of time signatures. ・Using these characteristics of the body and individual differences as triggers for varying the sound. Also, this allows for the performers to create different outcomes in every perfcontributing to the sense that this is a “living music.” And everyone can participate in its performance without specialized techniques or specialized notation. Each piece is not separated from each other with intervals for work as one theater piece represents one thing on the whole including lighting and costumes. My intension is not to create stages which is a mixture of music and performance as already seen in opera or musical. 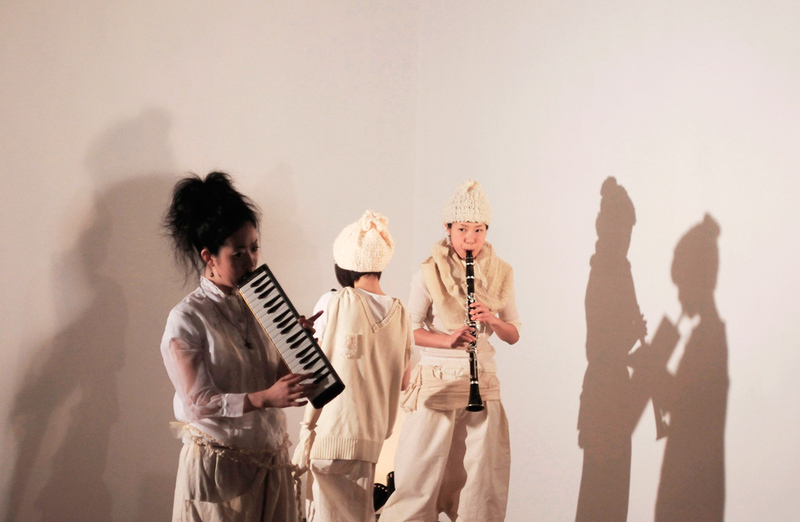 By our performance, I aim to show the new approach of “listening to sounds”. It means that audience have time to face themselves and seek each meanings through act of “listening to sounds”. One of my goals is to establish new expression in which audience can receive freely the sound with all sense.